Remember Me? Win a Blu-Ray Copy of Coco! Catching up as thoroughly as you can on all of the Oscar nominated films before next weekend? Let us help—both through filling you in as to what’s streaming through the typical coterie of your favorite services, and through a giveaway! The frontrunner for Best Animated Feature, Lee Unkrich’s Coco, comes out on blu-ray, DVD, and 4K UHD digital today (February 23rd), and we want to celebrate by giving a copy to three (3) of our readers, care of Walt Disney Studios. 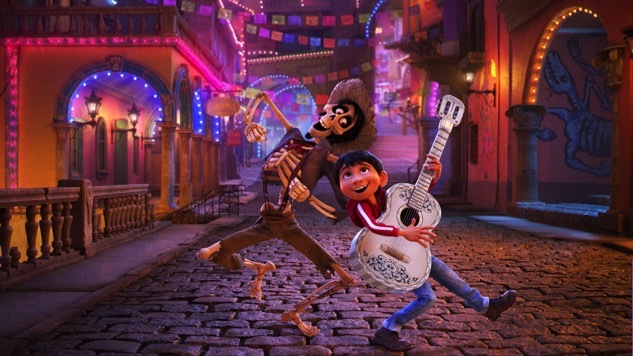 Fortunately, thanks to its story and, most importantly, its setting, Coco will count as one of the studio’s successes—and for many who long to see their culture center stage instead of just a flavor sprinkle, the story of Miguel (Anthony Gonzalez) as he struggles to pursue his dreams may prove Pixar’s most meaningful film yet. Each blu-ray and digital copy comes with an impressive boneyard of bonus content, from deleted scenes, to commentaries, to mini-documentaries and featurettes, to even handy guides ready to teach you how to draw a skeleton care of Pixar artist Daniel Arriaga. 3. Include the hashtag #Coco. And in the spirit of honoring spirits, we’ll pick a winner very soon!